This entry was posted on October 8, 2014 by George. Chairman George in China October 10-31 2013 ! China Greece Fusion PARTY MUSIC VIDEO available soon ! Touring China and Greece in 2014 ! Negotiating China endorsement deal for Greek Olive Oil ! This entry was posted on August 9, 2013 by George. This entry was posted on July 25, 2013 by George. 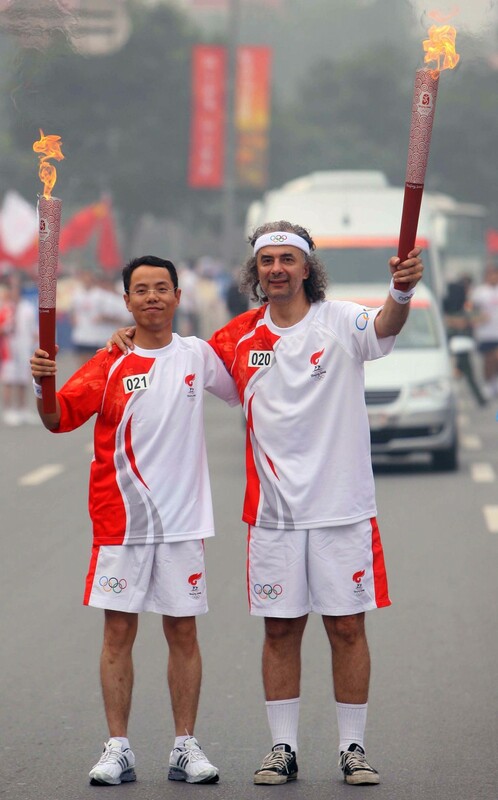 Imagine a 55-year-old Mandarin speaking Greek Canadian latter day bohemian, tall and lanky with wild shoulder length grey curls, a brilliant mathematician with a PhD in statistics – who also happens to be a bouzouki playing rocker, two time Olympic torch bearer, Olympic Village entertainer and multi-lingual singing ambassador at high profile cultural events in Ottawa, Toronto, and yes, China, a Peter Pan brimming with enthusiasm for life, yet who still lives at home with his mother. 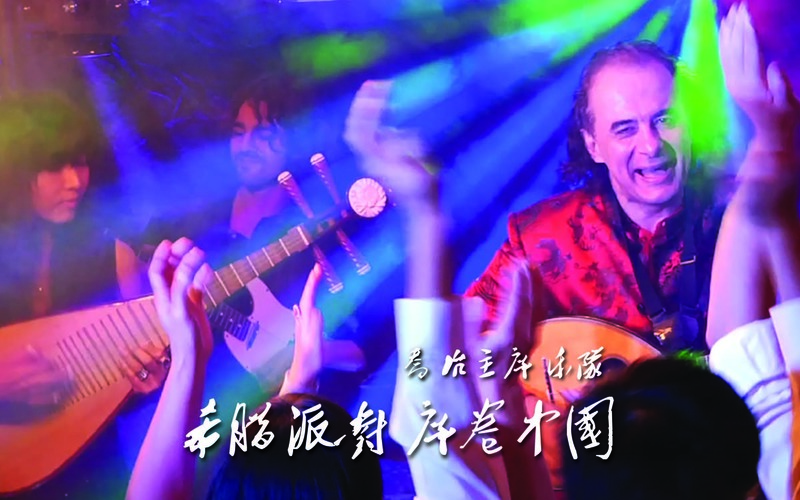 The many faceted George Sapounidis, aka “Chairman George”, is today considered a rock star in China, a Canadian troubadour enchanting Chinese audiences with a blend of passionate folk, rock and traditional Chinese songs. His mutual love affair with China has continued to grow – over 30 trips to perform in the last decade. And now he’s been invited to perform again, this time at the January 22nd opening ceremonies of the 2013 annual International Camellia Festival in Kunming, capital of south China’s Yunnan province. The festival showcases the camellia in all its forms at events from arts competitions to flower exhibitions. For a foreigner it’s a huge honor. 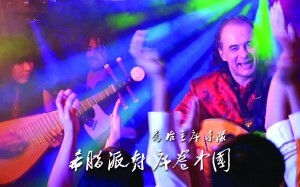 The turning point in Sapounidis’ Chinese connection was a concert called East meets West that he gave twelve years ago at the National Library of Canada Auditorium in Ottawa, (now Library and Archives Canada). He invited both Chinese and Greek diplomats. Within a few weeks he was winging his way to China at the invitation of the Chinese embassy to perform at two major international arts festivals in Shanghai and Nanning. He was an instant hit. Endless TV and radio interviews followed. People recognized him in the street. The anomaly of this gently intense, tall, charismatic middle aged foreigner singing his heart out and bantering with the audience in Mandarin spurred normally poker faced VIP politicians to break into broad smiles and clap – even sing – along with him. In the meantime, Sapounidis formed a band called Ouzo Power, and on his upcoming trip he will perform with his drummer and well known producer, Ross Murray who has collaborated with bands, composers, choreographers and film makers worldwide. George Sapounidis, the most charismatic and engaging of anomalies, acquired the handle, “Chairman George” from the title of a deeply personal award winning documentary that aired on CTV and the BBC in 2005. It chronicles his heartbreaking pursuit of a dream to perform at the opening ceremonies of the Beijing Olympics. The music from the documentary was released in a CD called “George from Athens to Beijing”, nominated for Best World Music at the Canadian Folk Music Awards. Canadian Chinese cultural leaders consider him a bridge builder between the Chinese community and mainstream Canadians. 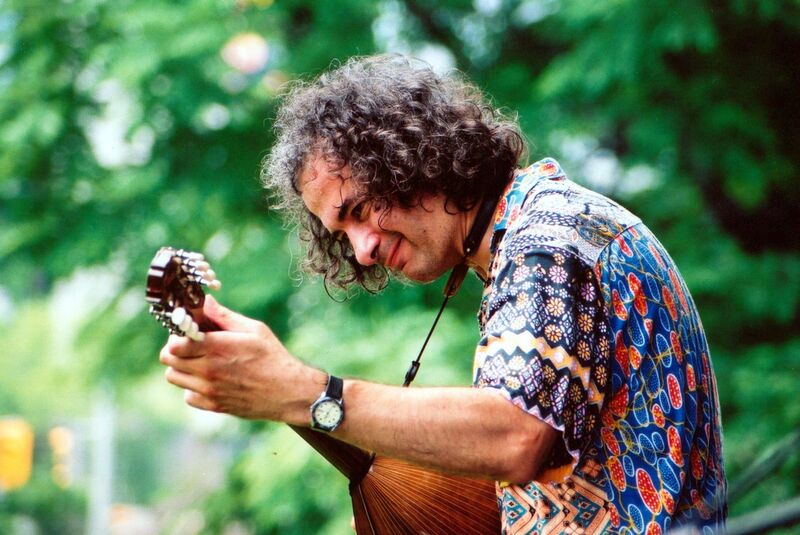 He has recently completed a new collection of Greek-Chinese fusion songs with Murray in a recording studio near Chelsea, Quebec which he will promote in his upcoming month long China trip. This entry was posted on January 12, 2013 by George. has proposed to write a folk song . I gladly accept. I prefer to talk about Chairman George in the third person as he is a character, tho true to life. It is a gift to be told that CG brings out ‘hope , joy and inspiration in people’. Thank you. One viewer alleged I use music however for my own purpose, that I like advertising myself. I allege it’s all about serving the people. Please continue sending me your genuine thoughts. This entry was posted in Uncategorized on August 27, 2006 by George.